These 13 inexpensive Halloween treats that aren't candy make the perfect allergy-free treats for Trick-or-Treaters for the Teal Pumpkin Project! Did you know that 1 in 13 children have food allergies? That’s about 5.9 million children under the age of 18, and 30% of those are allergic to more than one food! That’s a really good reason to offer inexpensive Halloween treats that aren’t candy this Halloween. Don't miss these easy Halloween snack ideas for the kids. If you decide to forgo candy in favor of other kinds of Halloween treats, be sure to paint one pumpkin on your front porch a teal color. It’s called The Teal Pumpkin Project and it tells parents that your home is safe for all trick-or-treaters, no matter their food allergies. Or if you’d rather, you can order an artificial teal pumpkin that you can use year after year. They also have terrific teal pumpkin garden flag signs available to hang in your front yard. Either way, displaying a teal pumpkin will get the message across that you have allergy-friendly treats to offer trick-or-treaters. What could be better than something that glows in the dark on Halloween? Kids love things that light up and these babies stay lit for over 8 hours. Even better? You’ll get 100 in a pack. 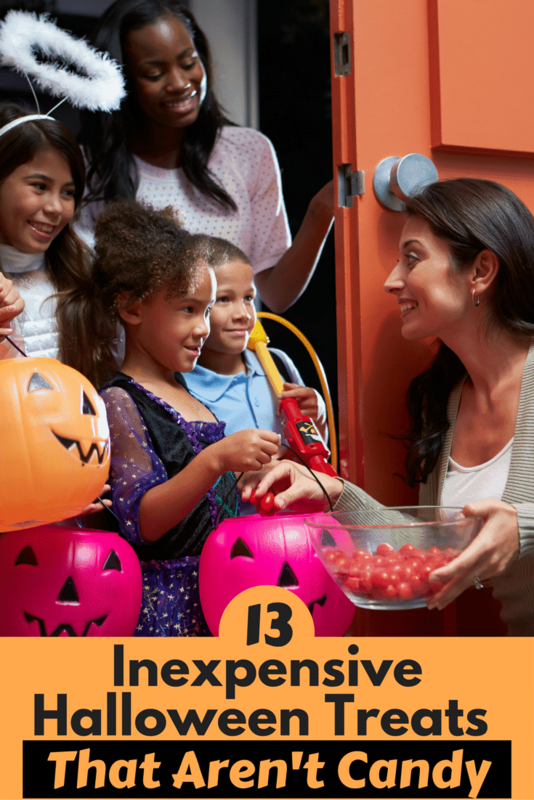 Unless you are a home that gets hundreds of kids a night, you can afford to drop 2 in everyone’s treat bag. If you can’t possibly use all of them in one night, no worries. They have a shelf life of 2 years prior to activation so you can save leftovers until next year! 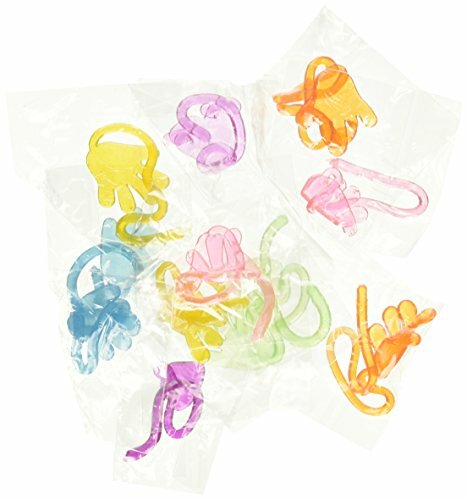 These glitter sticky hands come in assorted colors and individually wrapped, perfect for dropping in Halloween candy bags. The kids will love flinging them against walls, ceilings, or windows. They can also hold the tail of the sticky hand, slap the hand on something that doesn’t weigh a lot, and pull it up. These sticky hands are so silly and fun! 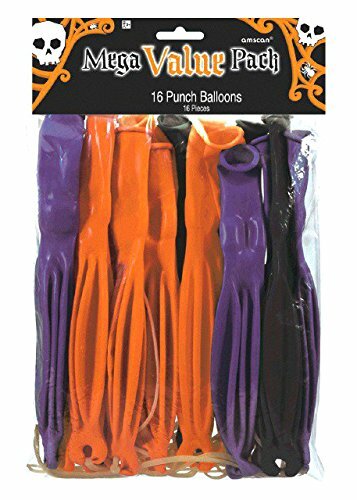 All set to keep the kiddos busy, these 12” Halloween Punch Balloon toys come in an assortment of colors and feature images of bats, jack-o-lanterns, and skulls. Just blow up the balloons to reveal the ghoulish images. They come 16 per package, so be sure to order a few packs if you get lots of kids ringing the bell on Halloween. 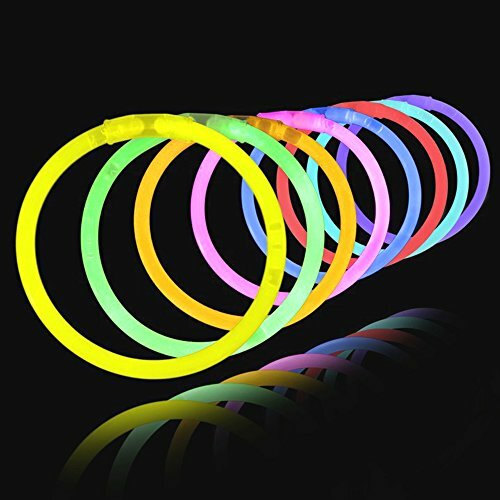 How about some fun light up rings? They are made out of a rubber material so they’ll stretch to fit the different finger size of all kiddos. Simply squeeze the ring to turn them off or on! 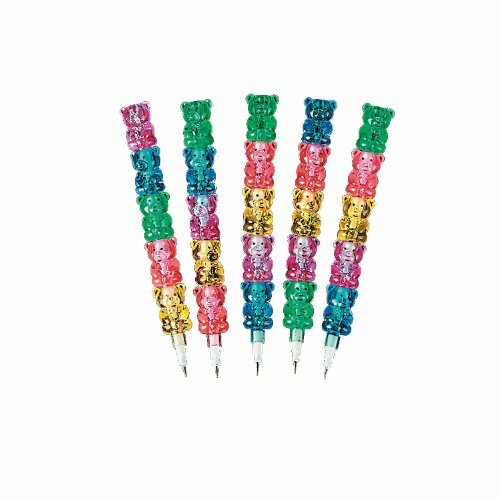 They come in assorted colors and designs, including spikes, crown, bubbles, pom poms, roses & hearts. 36 come in a pack, so order a few packs if you expect lots of trick-or-treaters this Halloween. These foam airplane gliders are all set to soar! They come individually wrapped, making a fantastic non-candy Halloween treat. The gliders are small, only about 1.5 inches each, so they will fit easily in trick-or-treaters goodie bags. Plus, they are super lightweight. 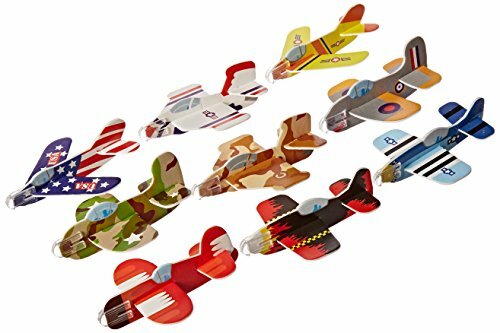 You will receive 72 foam gliders in various shapes and colors per package. Praised by teachers, Wikki Stix are colorful, non-toxic wax and yarn goodies are majorly versatile. Kiddos press them down on any smooth surface and they stick to create a 3D shape. They are removable so they’ll work over and over again. There are so many ways kids can play with Wikki Stix that you will find literally hundreds of tips & ideas on Pinterest. 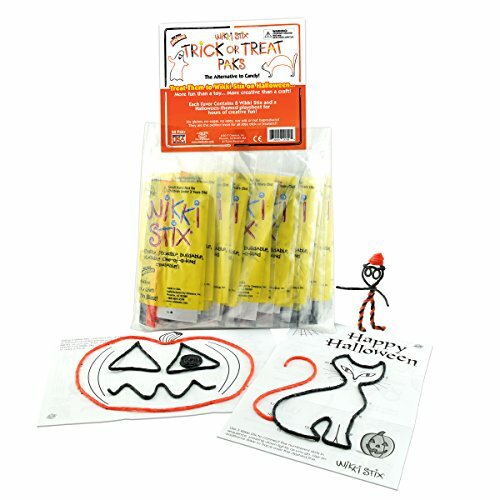 These Halloween Wikki Stix favors are designed with Trick-or-Treaters in mind and come in packs of 50. Each individually packaged favor comes with 8 black and orange Wikki Stix and a fun Halloween-themed activity sheet. These assorted colored Emoji Stampers will be a perfect non-candy Halloween treats for the trick-or-treaters. 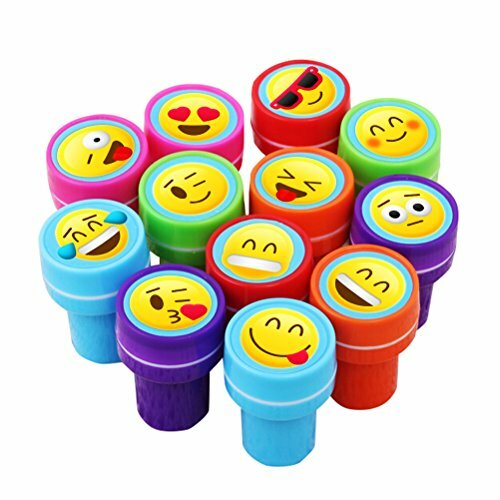 They come in 12 different emoji styles, are self-inking and oh-so-cute! The best part is, a whopping 60 come per order, so you might be able to get away with only one package. 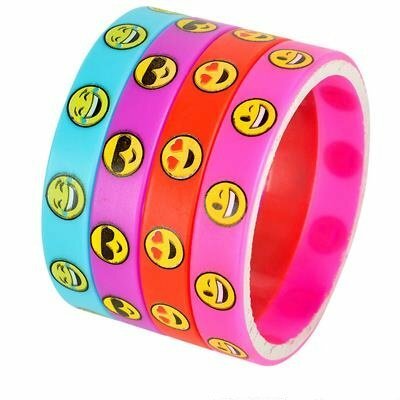 Speaking of emojis, kids are guaranteed to flip for these emoji silicone wristbands. They come in 4 assorted colors and with different emojis: heart eyes, winky face, laughing tears, and sunglass. 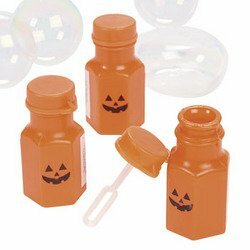 These are lots of fun, and last a whole lot longer than candy too! With 36 in each pack, these emoji bracelets are a really inexpensive alternative to Halloween candy. 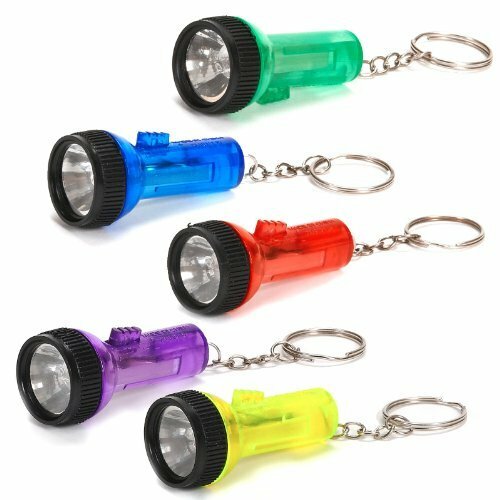 These flashlights are a great choice for a non-edible Halloween treat. Sure, kids don’t drive so a keyring might sound a little silly. What kids do enjoy are things that are small versions of stuff grownups have. They come in assorted colors and already have the batteries already in them so they are good to go. Just 12 flashlight come per order though, so you will want to get multiple packages for sure unless you live in a very remote area where you get under 12 trick-or-treaters. These Stackable Plastic Bear Pencils are absolutely darling and make a great halloween treat that insn't candy! Kids stack each little bear pencil on top of the other to create a colorful, larger pencil. 12 pencils, each made of 5 bears, come per package. In theory, that is 60 tiny pencils per order but it would likely be difficult to grasp and write with a pencil made with just 1 tiny bear. You should probably plan on handing out a couple bears to each trick-or-treater – 3 at minimum, or a full 5 bear pencil if you are feeling generous. 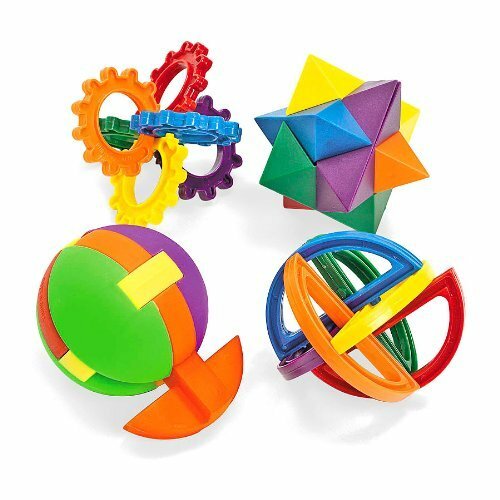 Colorful and about 2-3 inches in diameter, these Plastic Ball Puzzles would be fun long after Halloween has past. Some of the ball puzzles may be a little challenging for the younger kids, but that means other family members can help out. I am all for any toy that is challenging and encourages family interaction! Keep in mind that only 12 ball puzzles come per order, so ordering multiple packs might be smart. 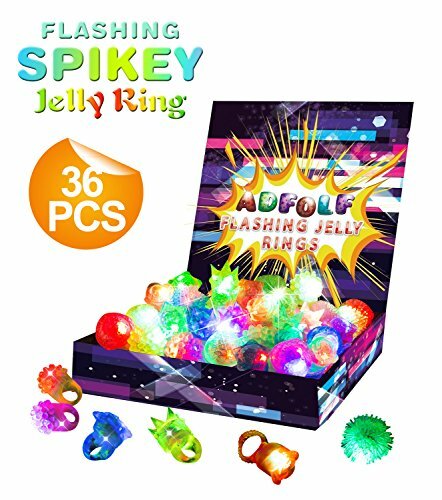 A whopping 48 bubbles come per package, so you might be able to get away with only ordering 1 pack. Or, you may want to pick up 2 packs to play it safe. 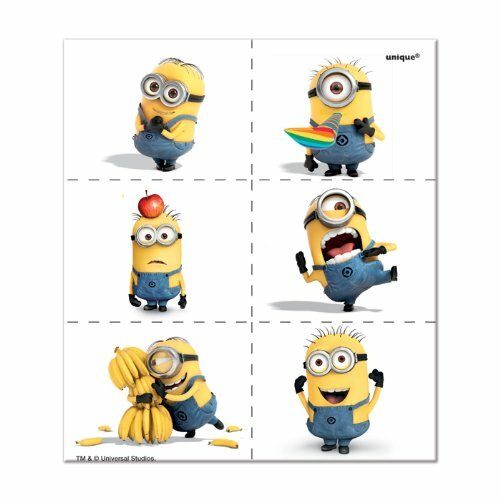 Minions are all the rage with the kiddos, so why not hand out Despicable Me Minion Temporary Tattoos this Halloween in lieu of candy? They wash off with soap and water, so Mom & Dad are as happy as the kids. Each package includes 4 tattoo sheets with 6 tattoos on each sheet. You can buy enough to hand out one tattoo sheet per trick-or-treater, or cut each sheet in half, thirds, or in 6 for an even bigger bargain. There you have it! Dentists everywhere will love you and Mom and Dad will be tickled pink to have one less piece of sugary candy in treat bags. What about you? Do you hand out candy, non-candy goodies like these, or a combo of both? This idea is very thoughtful and forward thinking! Kids with allergies should enjoy Halloween like everybody else and these little gifts, to me, are better than candies! I don’t celebrate Halloween (I’m from Italy), but some neighbors leave a candy bag out of their doors for the kids to grab! These are awesome ideas! I try to do less candy here- I am definitely going to pick up a few items to add to our allergy free bucket from your list! We just entered the world of Food Allergies this year. Lists like this and the Teal Pumpkin Initiative make my anxiety a little less. Thanks for the fantastic ideas! Great ideas! I love non-candy treats. We swap ours out for the switch Witch but maybe I’ll think of some of these non-candy treats this year! Sweet, a healthy alternative is always nice. Very good ideas! And, I didn’t know about the teal pumpkin! So cool!